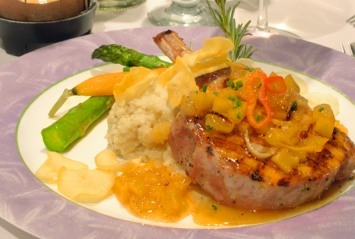 Cooking pork chops is easy with this delicious pork chop recipe flavored with orange. The orange juice and marmalade give it lots of flavor, the vinegar makes it very tender and the cooking method keeps the chops moist. Brown the pork chops in a hot skillet. Mix the remaining ingredients together and pour over the browned chops. Cover the skillet and simmer for 45 minutes, stirring occasionally until the chops are cooked and the sauce is thickened. Do not cook at too high a temperature or the sauce may burn. Simmer at a medium low heat and stir occasionally as suggested. Just cook up some rice and vegetables while the pork chops simmer and this is a very easy dinner recipe. This is a very quick and easy dinner recipe that you can make any night of the week. It is perfect for entertaining too. It is one of the best pork chop recipes I have come across in a long time. And the best part? It’s easy, easy, easy! Go from this pork chop recipe to look at our other delicious meat recipes. years ago, in a magazine, i found a picture and recipe for pork chops using tomato soup and worcheshire sauce, potatoes and carrots–i have lost my recipe and would like to know if anyone has it?